I have always been a big reader, and although I don't always have as much time as I'd like to dedicate to reading, I mostly do okay and manage to fit my reading into the time I have alloted to it. When I was a kid, though, when a book would grab me I pretty much could not put it down. I would read for hours and hour, and when that wasn't enough, I'd sneak the book places and read places I shouldn't. I have several distinct memories of reading during class, with the book under my desk, in Grades 8 and 9 and St. Joseph's Convent, where, let me say, novels were prohibited in the first place. Strangely, I don't remember if I ever got caught, but I doubt I was so subtle that none of the teachers knew what was up. 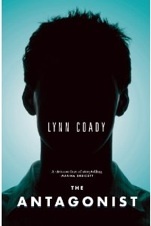 Anyway, it has been a while since I felt so compelled to read a book, but Lynn Coady's The Antagonist had me almost missing transit stops, reading with a booklight at night, and wishing desperately that I could pull it out of my bag when work got slow. The Antagonist is a one-sided epistolary novel. That is, e-mails are sent, but we only get one side of the story. The novel opens with Rank (nickname for Gordon Rankin, Jr.) writing an angry, and thus a little all over the place, e-mail to Adam, a guy he used to be friends with who, it seems, has written a book about Rank and something that happened to them when they were in university together. Rank is angry that Adam used him. Rank is angry that Adam told lies about him. Rank is angry that Adam boiled down huge parts of Rank's life to one-off throw-away sentences. So, Rank decides he's going to set the record straight and tell Adam his life story, to show him how much he got wrong in his book. It takes Rank a while to actually get started. A lot of the early e-mails are angry, and Rank gets distracted from the beginning of his story by events that, chronologically, should come later. Adam replies, and although we don't actually see his e-mail, Rank's response makes it pretty clear what Adam said. Namely: stop e-mailing me. Of course, Rank doesn't stop. In a nutshell (and Rank would hate that), he was adopted by his parents Gord and Sylvie. Gord the hateful, blasphemous, constantly swearing jerk, and Sylvie the ray of light. This really is how Rank sees his parents. Sylvie died a few years before Rank graduated high school, meaning he was left with Gord, who he hated (hates). Rank's problems with Gord have a lot to do with size. Rank is huge. He had an early growth spurt and at 14 was 6-foot-4, over 200 pounds, and had the deep voice and hair of a man. Basically, he wasn't some beanpole who still looked 14. Gord, on the other hand, is about 5-foot-4, so he loved that Rank was so big. In fact, he hired Rank to work at his Icy Dream franchise so Rank could "bust the skulls" of the punk kids who hung around. Despite his hulking size, this was not something Rank enjoyed. Flsash-forward a bit and Rank's in university on a hockey scholarship. He's a good player, but he refuses to fight, which pisses off his coach. He's also somehow become friends with three other guys who fit nowhere into the jock stereotype. One's a total stoner, one's a campus politician, and the other, Adam, is a nerd. Nonetheless, they all drink and get high and party together. Rank recounts some of their escapades from the third person, jumping in with his own perspective at the appropriate times, but it's clear the fond memories are tainted by what comes after, which Rank can't yet bring himself to talk about, but is clearly working up to. Rank starts his e-mails to Adam in May and they continue all summer. I didn't count, but there must be hundreds. Some of them, though, don't even talk about the past. In some, Rank is just talking about what he's dealing with now. He's nearly 40, not married, and mid-way through the summer he has to go home because Gord has fallen off the roof and needs someone to look after him. This second narrative is then woven through the first, so that Rank is forced to deal with his past not only through his memories but also his present, as Gord tries to reminisce. It's one of those lovely plot devices that, in the hands of a lesser writer would feel contrived, but Coady manages to get the tone just right, allowing everything to flow naturally from Rank. The Antagonist is a strange book in that way, because although you know Coady is the author, it's almost impossible to read this and not believe Rank is a real person. 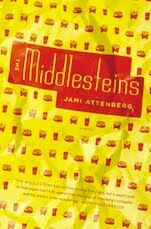 His writing style, language, anger, and the way he remembers things are so believable, so true somehow, that there were points in this novel that I forgot what I was reading was fiction. Rank's past is a bit of a mess, and it's clear that as much as it haunts him, he has never really thought about it this much. This correspondence, which begins out of anger, soon becomes a kind of unwittingly cathartic exercise that allows Rank to go back and deal with the memories and the events that he's had locked away for years. Of course, he doesn't realize that right away, so in the meantime he wavers between ranting and heartfelt storytelling. A lot of what Rank writes is hilarious – Gord is, when you step back, a bizarre and very funny character – and the laughs are tempered with the something, the events, that Rank can't quite bring himself to talk about yet. That balance, and the gravity of the unknown (well, unknown to us, known to Adam) is why The Antagonist can pack such a (metaphorical) punch, and why I (and perhaps the fictional Adam) will miss Rank's e-mails, despite never knowing I wanted them so much in the first place. I truly enjoyed this too: Rank is such an unforgettable character!